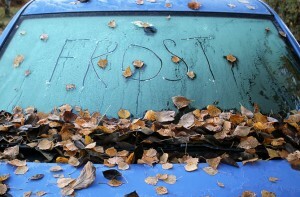 Fix Your Car In The Fall! Waiting until the bitter cold before thinking about fixing up those strange sounds? You may want to think again! Fall is the perfect time to get both minor as well as major repairs fixed on your newer or late model car. Extreme temperatures, both hot or cold can wreak havoc on small problems with your front end or under your hood. Something that may just be clicking now, may snap when the cold air hits. By repairing front-end damage before it becomes major, not only are you putting your safety first, but you will also save a ton of money. Is your car winter ready? Check Fluids– There are a variety of fluids that run through your vehicle. Transmission fluid, brake fluid, oil, antifreeze, etc., are all fluids that are essential to your car’s function. During the winter, your fluids will thicken, to help loosen your fluids, letting your car run for a short time before leaving is helpful. Replace old batteries- During the winter dead batteries are a very common problem. The cold temperatures make it harder on your battery to start your car. Typically batteries should be replaced every 3-4 years to maintain full function. Tire Quality- If the tires on your car are balding or are not properly aligned, it becomes a safety hazard. Winter tires are the best option as they are designed to handle extreme temperatures and weather conditions. Regardless of what type of work you need to be done on your car or truck, Mr. Muffler can help. We recommend scheduling an appointment to get a bumper to bumper inspection on your vehicle. The best time to make an appointment is now! Avoid the crazy busy times that winter brings into the shop. Our auto mechanics can provide you with an estimate and discuss with you what needs to be repaired on your car or truck.